Arthur Frederick Collyer was a blacksmith, farrier and wagon smith. He lived at 1888 Georgia Street from 1914 to 1916, and at 1890 Georgia Street in 1918. He was born in London (or in Southend, Essex) England, on March 23, possibly in 1883. In 1900, in West Ham district, Essex, Arthur married Gertrude Patience. It appears that Gertrude was born in 1879 (possibly on July 14, 1879) in Doddinghurst or Strood, Kent, England, and that her parents were John and Charlotte Patience. In 1901, Arthur and Gertrude were living in East Ham, Essex. Arthur was working as a domestic coachman. In 1911, Arthur and Gertrude were living in East Ham. By 1914, Arthur and Gertrude had arrived in Vancouver. In 1914 and 1915, they were living at 1888 Georgia Street. In 1914, Arthur was working as a blacksmith. By 1915, Arthur was a blacksmith for the Horse Show Association. In 1916, Arthur enlisted with the Canadian Expeditionary Force. [He said that his birthdate was March 23, 1881.] He served two years in France. While he was serving in the military, he had an abdominal injury for a time, as well as bronchitis and pneumonia. He recovered from these conditions, and he was discharged from the military forces on April 11, 1919. In 1920, Arthur and Gertrude, along with their family, went on a trip to the San Francisco area. At some point shortly after their arrival, Arthur’s military records showed that he was at 843 Stanley Road, San Leander, Oakland, California. However, there was still an Arthur Collyer in the Vancouver directories until 1922. In the 1921 Canada census, Arthur and the rest of the family were living at 1556 Georgia Street in Vancouver. By 1930, Arthur and Gertrude were living in Oakland, California. In 1942, Arthur registered with the United States military authorities. [He gave his birth date as March 23, 1884.] He and Gertrude were living at 1622 Harrison Street in Oakland. 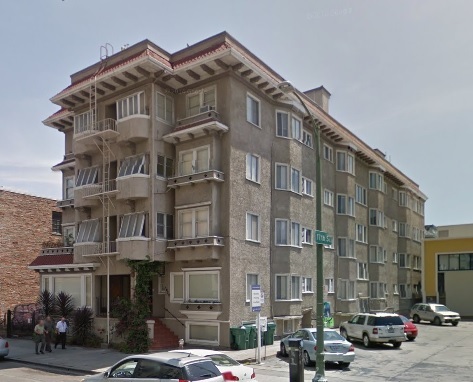 1622 Harrison Street, Oakland, California; Google Streets, searched April 17, 2015. Gertrude died on October 5, 1968, in Alameda County, California. Arthur and Gertrude had the following children. Ivy Beatrice Collyer was born in Fulham, London, England on November 16, 1903. On April 29, 1922, in Vancouver, Ivy married Alfred Orchard Gaskell (also called “Orrie”). He was born in Vancouver on August 7, 1892. His father was William James Gaskell (1864-1946). His mother was Wilhelmina (“Minnie”) Orchard (1874-1920). Orrie and Ivy were divorced in 1957. Orrie died in Nanaimo, British Columbia, on December 8, 1969. Ivy lived for a time in Chowchilla, California. Ivy’s second marriage was to Harley Campbell. He died before 2007. Ivy died in Parksville, British Columbia on August 14, 2006. Donald William Gaskell, who died in Nanaimo, British Columbia on December 1, 1999. Dorothy Gaskell, who was married to Leonard Joa, and living in Nanaimo. Ethel Maud Collyer was born on July 5, 1905, in Islington, London, England. She married Ernest Emil Tremblay in California, possibly around 1924. He was born in Taunton, Massachusetts on February 8, 1901. His father was Josephat Tremblay; his mother was Helene Beaulieu. In 1940, Ernest and Ethel were living in Alameda County, California. Ernest was working as a maintenance man in a steel mill. Ethel died in Alameda County, California, on June 12, 1992. Percy Arthur H. Collyer (Paul) appears to have been born in Brentford, Middlesex, England on June 14, 1907. He was married to Alma, who was born in West Virginia on April 24, 1907. In 1940, he was living in Oakland, California, along with his wife, Alma, and his daughter, Ruth. He was working as a bus driver. Alma died in San Leandro, Alameda, California, in May 5, 1978. Percy (Paul) died in Alameda County, California on March 26, 1986. Gladys Lillian Collyer was born in West Ham district, Essex, England on November 4, 1911. She married a Mr. Streeper. Gladys died in Alameda County, California on May 8, 1942. She was buried in Mountain View Cemetery in Oakland, California. Kenneth Howard Collyer was born in Canada, probably in Vancouver, on May 15, 1915. In 1940, he was living in Oakland, California. He was a grocery clerk. Kenneth died in Alameda County, California, on March 5, 1997. “England and Wales, Birth Registration Index, 1837-2008,” index, FamilySearch (https://familysearch.org/ark:/61903/1:1:2X2Q-3RB : accessed 18 April 2015), Arthur Collyer, 1883; from “England & Wales Births, 1837-2006,” database, findmypast (http://www.findmypast.com : 2012); citing Birth Registration, Rochford, Essex, England, citing General Register Office, Southport, England. “England and Wales, Marriage Registration Index, 1837-2005,” index, FamilySearch (https://familysearch.org/ark:/61903/1:1:26SF-92T : accessed 17 April 2015), Arthur Collyer, 1900; from “England & Wales Marriages, 1837-2005,” database, findmypast (http://www.findmypast.com : 2012); citing Marriage, West Ham, Essex, England, General Register Office, Southport, England. “England and Wales Census, 1901,” index, FamilySearch (https://familysearch.org/ark:/61903/1:1:X9J4-NTY : accessed 17 April 2015), Arthur Collier, East Ham, Essex, England; from “1901 England, Scotland and Wales census,” database and images, findmypast (http://www.findmypast.com : n.d.); citing county, registration district, East Ham subdistrict, PRO RG 13, The National Archives, Kew, Surrey. “England and Wales Census, 1911,” index, FamilySearch (https://familysearch.org/ark:/61903/1:1:XWFH-FW5 : accessed 17 April 2015), Arthur Collier, East Ham, , Essex, England; from “1911 England and Wales census,” database and images, findmypast (http://www.findmypast.com : n.d.); citing PRO RG 14, county, registration district, subdistrict, The National Archives of the UK, Kew, Surrey. Arthur Frederick Collyer, Canadian Expeditionary Force file: http://central.bac-lac.gc.ca/.item/?op=pdf&app=CEF&id=B1888-S003. “Washington, Seattle, Passenger Lists, 1890-1957,” index and images, FamilySearch (https://familysearch.org/ark:/61903/1:1:KY29-DTL : accessed 17 April 2015), Arthur F Collyer, ; citing Seattle, King, Washington, United States, NARA microfilm publication M1383, National Archives and Records Administration, Washington, D.C.; FHL microfilm 1,454,990; Washington, Seattle, Passenger Lists, 1890-1957; 054 – 12 Nov 1920 – 19 Dec 1920. 1921 Canada Census, Arthur Collier; Reference Number: RG 31; Folder Number: 18; Census Place: Ward 1, Vancouver Centre, British Columbia; Page Number: 12; Ancestry.com. 1921 Census of Canada [database on-line]. Provo, UT, USA: Ancestry.com Operations Inc, 2013. “United States Census, 1930,” index and images, FamilySearch (https://familysearch.org/ark:/61903/1:1:XCX4-5TS : accessed 17 April 2015), Arthur F Collyer, Oakland, Alameda, California, United States; citing enumeration district (ED) 0132, sheet 57A, family 60, line 29, NARA microfilm publication T626 (Washington D.C.: National Archives and Records Administration, 2002), roll 105; FHL microfilm 2,339,840. “United States World War II Draft Registration Cards, 1942,” index and images, FamilySearch (https://familysearch.org/ark:/61903/1:1:V4DM-XXW : accessed 17 April 2015), Arthur Fredrick Collyer, 1942; citing NAID identifier 603155, NARA microfilm publication M1936, M1937, M1939, M1951, M1962, M1964, M1986, M2090, and M2097 (Washington D.C.: National Archives and Records Administration, n.d.); FHL microfilm 2,393,863. “California Death Index, 1940-1997,” index, FamilySearch (https://familysearch.org/ark:/61903/1:1:VPJ3-PQ9 : accessed 17 April 2015), Arthur Fred Collyer, 29 Nov 1947; Department of Public Health Services, Sacramento. “California Death Index, 1940-1997,” index, FamilySearch (https://familysearch.org/ark:/61903/1:1:VPJ3-CP2 : accessed 17 April 2015), Arthur Fred Collier, 29 Nov 1947; Department of Public Health Services, Sacramento. “England and Wales Census, 1881,” index, FamilySearch (https://familysearch.org/ark:/61903/1:1:XQH7-FKM : accessed 17 April 2015), John Patience, Strood, Kent, England; from “1881 England, Scotland and Wales census,” database and images, findmypast (http://www.findmypast.com : n.d.); citing p. , PRO RG 11/, The National Archives, Kew, Surrey; FHL microfilm . “England and Wales Census, 1891,” index, FamilySearch (https://familysearch.org/ark:/61903/1:1:QGPY-JMM : accessed 17 April 2015), John Patience, England; from “1891 England, Scotland and Wales census,” database and images, findmypast (http://www.findmypast.com : n.d.); citing PRO RG 12, Essex county, registration district, BRENTWOOD subdistrict, The National Archives of the UK, Kew, Surrey. “England and Wales Census, 1891,” index, FamilySearch (https://familysearch.org/ark:/61903/1:1:QGPY-B6Z : accessed 17 April 2015), Charlotte Patience, England; from “1891 England, Scotland and Wales census,” database and images, findmypast (http://www.findmypast.com : n.d.); citing PRO RG 12, Essex county, registration district, BRENTWOOD subdistrict, The National Archives of the UK, Kew, Surrey. “England and Wales Census, 1891,” index, FamilySearch (https://familysearch.org/ark:/61903/1:1:QGPB-GN2 : accessed 17 April 2015), Gertrude Patience, England; from “1891 England, Scotland and Wales census,” database and images, findmypast (http://www.findmypast.com : n.d.); citing PRO RG 12, Essex county, registration district, BRENTWOOD subdistrict, The National Archives of the UK, Kew, Surrey. “England and Wales, Marriage Registration Index, 1837-2005,” index, FamilySearch (https://familysearch.org/ark:/61903/1:1:26SJ-JBL : accessed 17 April 2015), Gertrude Patience, 1900; from “England & Wales Marriages, 1837-2005,” database, findmypast (http://www.findmypast.com : 2012); citing Marriage, West Ham, Essex, England, General Register Office, Southport, England. “England and Wales Census, 1901,” index, FamilySearch (https://familysearch.org/ark:/61903/1:1:X9J4-NTB : accessed 17 April 2015), Gertrude Collier, East Ham, Essex, England; from “1901 England, Scotland and Wales census,” database and images, findmypast (http://www.findmypast.com : n.d.); citing county, registration district, East Ham subdistrict, PRO RG 13, The National Archives, Kew, Surrey. “England and Wales Census, 1911,” index, FamilySearch (https://familysearch.org/ark:/61903/1:1:XWFH-FWR : accessed 17 April 2015), Gertrude Collier, East Ham, , Essex, England; from “1911 England and Wales census,” database and images, findmypast (http://www.findmypast.com : n.d.); citing PRO RG 14, county, registration district, subdistrict, The National Archives of the UK, Kew, Surrey. “California Death Index, 1940-1997,” index, FamilySearch (https://familysearch.org/ark:/61903/1:1:VGRR-Z8Q : accessed 17 April 2015), Gertrude Collier, 05 Oct 1968; Department of Public Health Services, Sacramento. Cartwright/Stubson/Spencer/ Sinclair/Bischoff Family Tree, Ancestry.ca; Ivy Beatrice Collyer; father: Arthur Collyer; mother: Gertrude Patience. Borne 1903 in England; married in British Columbia. “England and Wales, Birth Registration Index, 1837-2008,” index, FamilySearch (https://familysearch.org/ark:/61903/1:1:2FD8-SS9 : accessed 17 April 2015), Ivy Beatrice Collyer, 1903; from “England & Wales Births, 1837-2006,” database, findmypast (http://www.findmypast.com : 2012); citing Birth Registration, Fulham, London, England, citing General Register Office, Southport, England. “England and Wales Census, 1911,” index, FamilySearch (https://familysearch.org/ark:/61903/1:1:XWFH-FWT : accessed 17 April 2015), Ivy Beatrice Collier, East Ham, , Essex, England; from “1911 England and Wales census,” database and images, findmypast (http://www.findmypast.com : n.d.); citing PRO RG 14, county, registration district, subdistrict, The National Archives of the UK, Kew, Surrey. “British Columbia Death Registrations, 1872-1986,” index and images, FamilySearch (https://familysearch.org/ark:/61903/1:1:FL2R-K57 : accessed 17 April 2015), William James Gaskell, 08 May 1946; citing Vancouver, British Columbia, Canada; British Columbia Archives film number B13190, Division of Vital Statistics, Victoria; FHL microfilm 2,032,422. “Find A Grave Index,” index, FamilySearch (https://familysearch.org/ark:/61903/1:1:QVV5-3DQC : accessed 17 April 2015), William James Gaskell, 1946; Burial, Vancouver, Greater Vancouver Regional District, British Columbia, Canada, Mountain View Cemetery; citing record ID 26273002, Find a Grave, http://www.findagrave.com/cgi-bin/fg.cgi?page=gr&GRid=26273002. “British Columbia Death Registrations, 1872-1986,” index and images, FamilySearch (https://familysearch.org/ark:/61903/1:1:FLKF-1H5 : accessed 17 April 2015), Minnie Gaskell, 19 Mar 1920; citing Vancouver, British Columbia, Canada; British Columbia Archives film number B13117, Division of Vital Statistics, Victoria; FHL microfilm 1,927,294. “British Columbia Birth Registrations, 1854-1903,” index and images, FamilySearch (https://familysearch.org/ark:/61903/1:1:JDZX-45L : accessed 17 April 2015), Alfred Orchard Gaskell, 07 Aug 1892; citing British Columbia Archives film number B13810, Vital Statistics Agency, Victoria; FHL microfilm 2,114,718. “Canada Census, 1901,” index, FamilySearch (https://familysearch.org/ark:/61903/1:1:KHVN-R1C : accessed 17 April 2015), Alfred O. Gaskell in household of William J. Gaskell, D, Burrard, British Columbia, Canada; citing p. 11, Library and Archives of Canada, Ottawa. “Recensement du Canada de 1911,” index, FamilySearch (https://familysearch.org/ark:/61903/1:1:27XB-72X : accessed 17 April 2015), Orrie Gaskill in entry for William Gaskill, 1911; citing Census, Vancouver Sub-Districts 19-50, British Columbia, Canada, Library and Archives of Canada, Ottawa, Ontario; FHL microfilm . “British Columbia Marriage Registrations, 1859-1932,” index and images, FamilySearch (https://familysearch.org/ark:/61903/1:1:JDZ1-RV4 : accessed 17 April 2015), Orrie Alfred Gaskell and Ivy Beatrice Collyer, 29 Apr 1922; citing Vancouver, British Columbia, Canada, British Columbia Archives film number B13743, Vital Statistics Agency, Victoria; FHL microfilm 2,074,225. Border Crossings: From Canada to U.S., 1895-1956; NAME: Ivy Beatrice Gaskell l; BIRTH: 16 Nov 1903; England; ARRIVAL: 5 Dec 1949 – Blaine, Washington, USA; RESIDENCE: Canada; ancestry.ca. “British Columbia Death Registrations, 1872-1986,” index and images, FamilySearch (https://familysearch.org/ark:/61903/1:1:FLYC-BR2 : accessed 17 April 2015), Alfred Orchard Gaskell, 08 Dec 1969; citing Nanaimo, British Columbia, Canada; British Columbia Archives film number B13300, Division of Vital Statistics, Victoria; FHL microfilm 2,034,111. Nanaimo Obituaries 1998-1999; http://www.members.shaw.ca/nfhslibrary/1998.htm; GASKELL, Don William; Nanaimo; 01-Dec-99. Donald William Gaskell; Interactive Search, http://obits.rootsweb.ancestry.com/cgi-bin/obit.cgi?Surname=harewell%2Bwilliam+%22&type=Keyword&Start=131750; GASKELL, Don William; Nanaimo; 01-Dec-99; GASKELL, Don William; 71; BC; Province; 1999-12-3; verbeek; GASKELL, Don William; 71; Gabriola Island BC; Vanc Sun; 1999-12-3; mumtaz. “England and Wales, Birth Registration Index, 1837-2008,” index, FamilySearch (https://familysearch.org/ark:/61903/1:1:2FX1-LCW : accessed 17 April 2015), Ethel Maud Collyer, 1905; from “England & Wales Births, 1837-2006,” database, findmypast (http://www.findmypast.com : 2012); citing Birth Registration, Islington, London, England, citing General Register Office, Southport, England. “England and Wales Census, 1911,” index, FamilySearch (https://familysearch.org/ark:/61903/1:1:XWFH-FWY : accessed 17 April 2015), Ethel Maud Collier, East Ham, , Essex, England; from “1911 England and Wales census,” database and images, findmypast (http://www.findmypast.com : n.d.); citing PRO RG 14, county, registration district, subdistrict, The National Archives of the UK, Kew, Surrey. California, Marriage Records from Select Counties, 1850-1941; NAME: Ernst E Tremblay; SPOUSE: Ethel Maud Collyer; OTHER: Gertrude Patience; ancestry.ca. “United States Census, 1910,” index and images, FamilySearch (https://familysearch.org/ark:/61903/1:1:M2J9-2XF : accessed 18 April 2015), Ernest Tremblay in household of Josephat Tremblay, Taunton Ward 8, Bristol, Massachusetts, United States; citing enumeration district (ED) 246, sheet 19A, family 323, NARA microfilm publication T624 (Washington, D.C.: National Archives and Records Administration, n.d.); FHL microfilm 1,374,593. “United States Census, 1920,” index and images, FamilySearch (https://familysearch.org/ark:/61903/1:1:SP8R-718 : accessed 18 April 2015), Ernest E Tremblay, Overseas Military, Philippine Islands; citing sheet 33B, family , NARA microfilm publication T625 (Washington D.C.: National Archives and Records Administration, n.d.); FHL microfilm 1,822,040. “California Death Index, 1940-1997,” index, FamilySearch (https://familysearch.org/ark:/61903/1:1:VP8F-S5D : accessed 18 April 2015), Ernest Emil Tremblay, 02 May 1986; Department of Public Health Services, Sacramento. “California Death Index, 1940-1997,” index, FamilySearch (https://familysearch.org/ark:/61903/1:1:VPD4-WYY : accessed 17 April 2015), Ethel Maud Tremblay, 12 Jun 1992; Department of Public Health Services, Sacramento. “California Birth Index, 1905-1995,” index, FamilySearch (https://familysearch.org/ark:/61903/1:1:V251-GV5 : accessed 18 April 2015), Ernest Arthur Tremblay, 30 Jan 1926; citing Alameda, California, United States, Department of Health Services, Vital Statistics Department, Sacramento. “United States Social Security Death Index,” index, FamilySearch (https://familysearch.org/ark:/61903/1:1:KZ59-Y4P : accessed 18 April 2015), Ernest A Tremblay, 13 Oct 2012; citing U.S. Social Security Administration, Death Master File, database (Alexandria, Virginia: National Technical Information Service, ongoing). “England and Wales, Birth Registration Index, 1837-2008,” index, FamilySearch (https://familysearch.org/ark:/61903/1:1:2FJC-DHJ : accessed 17 April 2015), Percy Arthur H Collyer, 1907; from “England & Wales Births, 1837-2006,” database, findmypast (http://www.findmypast.com : 2012); citing Birth Registration, Brentford, Middlesex, England, citing General Register Office, Southport, England. “England and Wales Census, 1911,” index, FamilySearch (https://familysearch.org/ark:/61903/1:1:XWFH-FWB : accessed 17 April 2015), Percy Arthur Collier, East Ham, , Essex, England; from “1911 England and Wales census,” database and images, findmypast (http://www.findmypast.com : n.d.); citing PRO RG 14, county, registration district, subdistrict, The National Archives of the UK, Kew, Surrey. “United States Census, 1940,” index and images, FamilySearch (https://familysearch.org/ark:/61903/1:1:K9ZP-88B : accessed 17 April 2015), Paul H Collier, Councilmanic District 5, Oakland, Brooklyn Judicial Township, Alameda, California, United States; citing enumeration district (ED) 61-169, sheet 4B, family 122, NARA digital publication T627 (Washington, D.C.: National Archives and Records Administration, 2012), roll 434. “United States Social Security Death Index,” index, FamilySearch (https://familysearch.org/ark:/61903/1:1:JB76-S3B : accessed 17 April 2015), Paul Collier, Mar 1986; citing U.S. Social Security Administration, Death Master File, database (Alexandria, Virginia: National Technical Information Service, ongoing). “California Death Index, 1940-1997,” index, FamilySearch (https://familysearch.org/ark:/61903/1:1:VG11-14Y : accessed 18 April 2015), Paul H Collier, 26 Mar 1986; Department of Public Health Services, Sacramento. “California Death Index, 1940-1997,” index, FamilySearch (https://familysearch.org/ark:/61903/1:1:VGTW-K7T : accessed 18 April 2015), Alma Mae Collier, 05 May 1978; Department of Public Health Services, Sacramento. “England and Wales, Birth Registration Index, 1837-2008,” index, FamilySearch (https://familysearch.org/ark:/61903/1:1:2FGQ-NXP : accessed 17 April 2015), Gladys L Collyer, 1911; from “England & Wales Births, 1837-2006,” database, findmypast (http://www.findmypast.com : 2012); citing Birth Registration, West Ham, Essex, England, citing General Register Office, Southport, England. “California Death Index, 1940-1997,” index, FamilySearch (https://familysearch.org/ark:/61903/1:1:VPQ7-7S4 : accessed 17 April 2015), Gladys Lillian Streeper, 08 May 1942; Department of Public Health Services, Sacramento. “BillionGraves Index,” index, FamilySearch (https://familysearch.org/ark:/61903/1:1:KX1C-S9X : accessed 17 April 2015), Gladys L Streeper, 1942; citing Mountain View Cemetery, Oakland, California, BillionGraves (http://billiongraves.com/pages/record/person/3353144#given_names=Gladys&family_names=Streeper : 2012). “United States Census, 1940,” index and images, FamilySearch (https://familysearch.org/ark:/61903/1:1:K9HH-1PY : accessed 17 April 2015), Kenneth Collier, Councilmanic District 3, Oakland, Oakland Judicial Township, Alameda, California, United States; citing enumeration district (ED) 61-125, sheet 1B, family 61, NARA digital publication T627 (Washington, D.C.: National Archives and Records Administration, 2012), roll 444. “United States Social Security Death Index,” index, FamilySearch (https://familysearch.org/ark:/61903/1:1:JG7J-RM9 : accessed 17 April 2015), Kenneth H Collier, 05 Mar 1997; citing U.S. Social Security Administration, Death Master File, database (Alexandria, Virginia: National Technical Information Service, ongoing). “California Death Index, 1940-1997,” index, FamilySearch (https://familysearch.org/ark:/61903/1:1:VPVP-JRF : accessed 17 April 2015), Kenneth Howard Collier, 05 Mar 1997; Department of Public Health Services, Sacramento.